“Dumbo” is the first of four planned live-action remakes to classic Disney animated films that are slated for release in 2019. If “Dumbo” is any indication to how these other movies are going to turn out, they will be pleasantly surprising but ultimately nothing impressive. A circus discovers that their new baby elephant, born with oversized ears, has the ability to fly. After this discovery is brought to the public’s attention, the owner of a massive theme park (Michael Keaton) cons the circus to get a hold of the elephant. The aforementioned description of “Dumbo” as being pleasantly surprising but ultimately nothing impressive means that it actually made some changes and took some creative liberties with the story, but the end product was still nothing worthwhile. One of the biggest fears about the upcoming group of live-action Disney remakes is that they are essentially going to be the same movie over again, like the live-action “Beauty and the Beast” from 2017 was. “Dumbo” is fortunately different enough from the original that it is at least understandable that it was remade. Aside from a few references to the earlier film such as a few songs, storks and the pink elephants among other things, the plot and characters are completely different. That being said, the plot is fairly straight forward, and even a little clunky, with nothing interesting done to make it stand out and the characters are all fairly dull. The three-act structure feels a bit wonky at times, where it is hard to figure out where one act ends and the next one begins. The first act is overstuffed with essentially all of the plot points, plus a few added ones, from the original “Dumbo” from 1941. Then, the circus is at Michael Keaton’s theme park where it feels like everything happens within the span of 30 minutes. After that, the third act goes full out and is tonally different from the rest of the film to the nth degree. The characters are at least different enough personality-wise so that they do not feel like interchangeable blank slates, but none of their character arcs end up being that interesting or investment-worthy. Not just that, but the antagonist played by Michael Keaton is just flat-out badly written. When he is introduced, it is obvious to the audience that Keaton will be the bad guy, but he is written in a manner where his badness is subtle and easy to overlook. Once the third act starts, however, he becomes 100 percent evil to the point where he is making illogical decisions just so the plot can move forward. While the characters are not that interesting, the actors at least do good jobs. Both Colin Farrell and Eva Green are strong in their roles and, despite the poorly written role, Michael Keaton is great like he always is. Danny DeVito, however, gives the best and most enjoyable performance in the movie, so much so that he is the best part of the whole show. “Dumbo” was directed by Tim Burton (“Beetlejuice,” “Edward Scissorhands”), who is well known for his distinctive, gothic aesthetics. 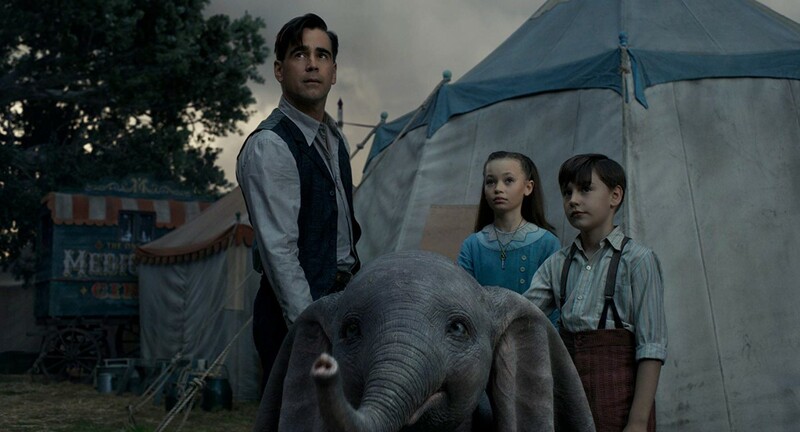 “Dumbo” has a similar aesthetic to it, which serves to provide the movie with a unique look and interesting visuals. What is really impressive is that Burton manages to meld this darker aesthetic with some of the cuter visuals that come with the premise of a circus that owns a flying elephant. While the aesthetics do not conflict with each other, one of the film’s main messages does have a contradictory element to it. The message in question is that large corporations end up hurting the little guy by exploiting them, taking what they want and dumping everything else without a thought in the world. This is quite the message for a Disney film to have, especially in a film that was released one week after the Disney acquisition of 21st Century FOX, which resulted in at least 4,000 people being laid off. Now, the argument can be made to separate the art from the artist, or in this case the art from the studio, but the staggering hypocrisy and lack of self-awareness makes this nearly impossible to do. “Dumbo” is surprisingly better than anticipated. However, that does not mean much when the expectation was that it would be terrible and it ended up being passable.